Many of our clients have come to us with questions about inbound marketing. They’re either new to inbound marketing or need help improving the effectiveness of specific parts of their program. To lend a hand, I decided to write a reference guide on the topic. It's an easy to read, interactive PDF full of useful facts, figures, links and specific instructions to start up - or tune up - your inbound marketing program. Inbound marketing isn't an event, it's a discipline. And as many companies know, it is one of the most cost effective ways to find, attract, and engage prospects. In this interactive E-Guide you'll learn the statistics that show that inbound marketing isn't just for B2C. You'll learn why it's becoming the cornerstone of the most effective B2B marketing organizations. And you'll learn the steps required to get your program in shape. These 10 steps, when practiced with dedication, will change the marketing - and sales - lives of the companies that implement it. Nothing that is life changing is easy. But these steps are do-able and when consistently applied, the results are guaranteed. More inbound traffic. More leads. More engagement with your target market. More sales. Yes, more sales. 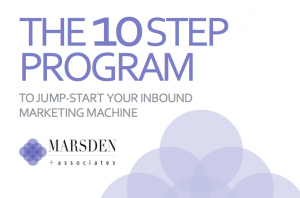 So if you want to learn how to jump-start or re-invigorate your inbound marketing program, click here to download your free copy.